The follow-up to the New York Times bestselling The Life-Changing Magic of Tidying Up, from the star of the hit Netflix series Tidying Up with Marie Kondo. Japanese decluttering guru Marie Kondo has revolutionized homes--and lives--across the world. 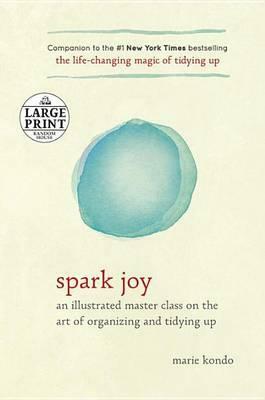 Now, Kondo presents an illustrated guide to her acclaimed KonMari Method, with step-by-step folding illustrations for everything from shirts to socks, plus drawings of perfectly organized drawers and closets. She also provides advice on frequently asked questions, such as whether to keep "necessary" items that may not bring you joy. With guidance on specific categories including kitchen tools, cleaning supplies, hobby goods, and digital photos, this comprehensive companion is sure to spark joy in anyone who wants to simplify their life. New York Times Best Seller ." . . the organization expert who dazzled the world with her Life-Changing Magic of Tidying Up is back with more spirit-rousing advice." -- The London Times From the Hardcover edition. MARIE KONDO is a professional cleaning consultant with a three-month waiting list. Inspired by the Japanese book Throw-Out Skills and a lifelong love of all things house and home, she began her study of the art of cleaning, established her consulting business, and founded the KonMari Method. Her courses, "Lessons on Organization and Storage for Women" and "Lessons on Organization and Storage for Company Presidents," have many dedicated fans. Her previous book, The Life-Changing Magic of Tidying Up, is a #1 New York Times bestseller and has become a worldwide sensation. From the Audiobook Download edition.